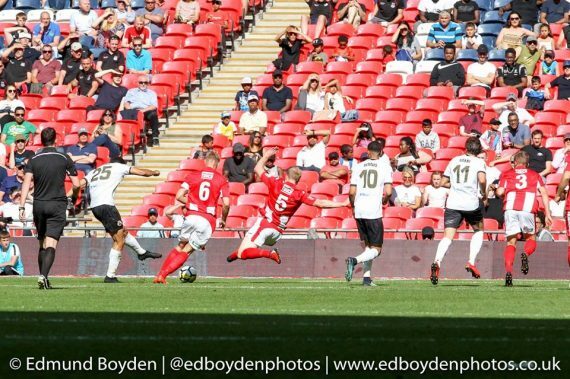 Bromley’s season ended in heartbreak as they lost on penalties in the FA Trophy final. Omar Bugiel scored on 19 minutes, finishing an attack started by Adam Mekki’s fantastic run. Bromley thought they had won the game in 90 minutes until Gareth Dean equalised in the fifth minute of additional time. The game went to extra time and it was the Northamptonshire side who prevailed after the resulting shoot out went to sudden death. Despite Brackley playing in a division below the Kent side, it was the Saints who has the brighter opening chances. Matt Lowe was released from his right back spot before his low effort was blocked. Lowe remained dangerous in the first ten minutes. After he was pulled to the ground Shane Byrne’s free kick was bundled wide by Aaron Williams. Soon the Ravens were able to work their way back into the game. Bugiel fired into the side netting after good work from Frankie Raymond and it didn’t take long for Neil Smith’s side to take the lead. Mekki broke away on a weaving run before getting caught up and finding Bugiel to his left. The Forest Green loanee kept his composure to fire a low shot past Danny Lewis after 19 minutes. The Kent side’s pressure went on with Bugiel unable to reach a cross from the right, allowing George Porter to hit a well struck volley that was fantastically saved from Lewis. Momentum continued to change throughout the half. Brackley started to look to the wings for support but Rodger Johnson and his defensive team mates held firm. There was a scare for Bromley in injury time of the first half when Byrne blasted a volley wide from the edge of the area. Jack Holland was close to giving the Ravens an early second half goal when he flicked a header towards goal, only for the ball to be beaten away by Lewis. Their defence was tested moments after through a James Armson strike but the midfielder’s left footed effort rolled inches wide of the post. The whites came equally close when Louis Dennis found Frankie Sutherland on the edge of the area, only for Sutherland to curl a shot just wide. Soon they were under a barrage of pressure from the Northamptonshire club. A goalline scramble ended with Gregory tipping a shot onto the post before spectacularly denying another effort. The spell of pressure came to an end with Jordan Higgs clearing a shot off the line. Chances also fell to Aaron Williams and Armson but the Kent side did well to hold firm against a bombardment of Brackley chances. At the other end substitute Brandon Hanlan had a shot blocked and, with 88 minutes gone, he had a one on one opportunity blocked but that was the best chance Bromley had to double their lead. Five added minutes gave Brackley a last chance saloon and they took it after further pressure. A long range effort hit the post before Gareth Dean hit home the rebound. Extra time offered little in the way of chances but, with tiredness becoming an issue, it was Brackley who had the better of the chances. The best came from Steve Diggin’s cross which evaded everyone in the six yard box. Penalty goals from Sutherland, Redmond, Rees and Hanlan wasn’t enough as, after sudden death, it was Brackley who came away victorious. Pictures supplied by Ed Boyden. This entry was posted	on Sunday, May 20th, 2018 at 7:30 pm	and is filed under Featured, Football, Non-League Football. You can follow any responses to this entry through the RSS 2.0 feed. Both comments and pings are currently closed.